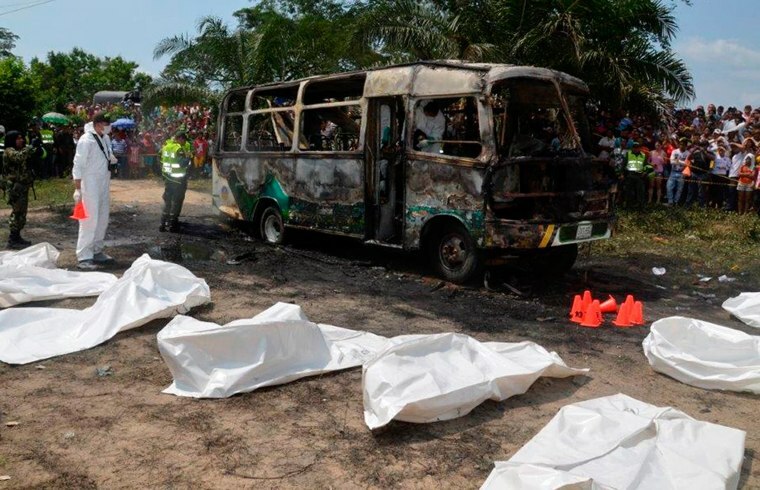 Thirty-one children and one adult were killed in Colombia on Sunday when fuel exploded on a broken-down bus returning from a church event, an official said. The charred bodies of victims were being identified using dental records in Barranquilla, the nearest city to Fundacion town where the accident happened, said Major Eduardo Velez, coordinator of Magdalena province's emergency response corps. Eighteen people managed to escape and were being treated at hospitals in the region. "There was a canister of gasoline inside the vehicle. The fire spread very fast," Velez told Reuters. He said the fire started after the driver attempted to start the faulty bus by pouring fuel into the engine that he accessed through the floor of the cabin. The driver escaped unharmed and was being questioned by police, he said. The bus was owned by a private transport company and was used during the week to take children to and from school. President Juan Manuel Santos was traveling to Fundacion to console relatives of the victims.